ALL PLAN MED QUOTE LAUNCHES A SISTER TO ORIGINAL WEBSITE! How Do I Calculate My Obamacare Premium Subsidy? I’m Can Help You Apply For ACA Health Insurance . . . Errr . . . I Think! It Was My Impression The Current Administration Has Always Supported Greater Regulation! Navigator Vs. Insurance Broker: Who To Go To For Your New Affordable Care Act Health Insurance? That Giant “Sucking Sound” is Your Providers Exiting Your Preferred Provider Network! Why Would Insurance Companies Keep This Agent In the Dark About Affordable Care Act Plan Premiums? CENTER FOR MEDICARE SERVICES DELAYS CUTS TO MEDICARE ADVANTAGE – OR DID THEY? Obamacare and Medicare Don’t Mix! Anyone who tells you they know what the next few months before health insurance OPEN ENROLLMENT (OE)―the period during which individuals and families may apply for and obtain coverage for the coming calendar year―will produce definitively, is deluding themselves. OE is scheduled to begin November 1 and run through December 7th. At this point, the only safe prediction is the preservation of the status quo. In other words, premiums will increase another 15 to 25% minimum; there will be fewer options regarding carriers and plans and fewer in-network medical providers from which to choose. In some parts of the country, it will be even worse, with only one carrier to choose from and―in some cases ― none. Whether that will be the case in Texas remains to be seen. 2) In the area of Houston, one more carrier―Memorial Hermann Health Plan―has announced they are withdrawing from the market. All of their current policyholders must find replacement coverage for 2018. 3) Humana has canceled all their current individual and family plans effective July 1 and will not participate in the market in 2018. This is in addition to Aetna, Cigna’s and Unitedhealthcare’s withdrawal from the market in 2017. 4) Residents of Harris, Fort Bend, and Montgomery Counties will (hopefully) have only plans from BlueCross BlueShield of Texas, Community Health Choice, and Molina Healthcare from which to choose. 5) The only remaining network option available from the above-referenced carriers will be Health Maintenance Organization (HMO) plans where the insured individual must seek treatment within the network or have no coverage whatsoever. Here is an important change this editor (who is also a health insurance broker) recently learned. Married couples who are small business owners seeking Preferred Provider Organization (PPO) coverage as a way of having access to providers and treatment―will no longer be eligible for coverage with most (if not all) small group carriers unless they had a minimum average of one W-2 employee in the previous calendar year. This new stipulation would have prevented many of my business owner clients from obtaining the group PPO health insurance they now have, had it been in effect before January 1 of 2017. A prospective client of mine whose family coverage was canceled by Humana, July 1―in the midst of cancer treatment―now finds himself denied covered access to his oncologist and hospital. It appears all ongoing medical treatment from those providers, at least through the remainder of the year, will be self-funded. If you are a small business owner considering moving to group insurance in 2108, bear this in mind and begin paying at least one employee W-2, full time, through the remainder of 2017. Small business owners considering a move to small group coverage who can meet this eligibility requirement, please contact me for assistance in making the transition. For individuals and families who do not have a business, or employer sponsored health insurance, I will have whatever health insurance options are available to residents of your county and will soon begin testing and certifying (as I must each fall) to market these plans for the coming calendar year. I will be able to assist you whether you qualify for a subsidy of your health insurance premium or do not. If you do, I believe it will be much easier to obtain your subsidy and health insurance through me than by dealing with the marketplace, Healthcare.gov. If you do not qualify for a one, I have a strategy for minimizing your premium while giving you access to the provider of your choice. It is not appropriate for everyone, but it has worked for many of my clients. Though I see little reason to be optimistic for a solution to the aforementioned problems until the Patient Protection and Affordable Care Act (Obamacare) implodes entirely, and Congress is forced to unite to provide a workable solution, let’s hope enough reasonable minds prevail before it comes to that. In the meantime, I am here to assist in acquiring the best available option, as I have for the past 26 years. Senate Republican leaders signaled Monday that they intend to move on from health care to other legislative priorities, even as President Trump continued to pressure lawmakers to repeal and replace the Affordable Care Act. The discord comes amid uncertainty in the insurance industry and on Capitol Hill about what will come next after last week’s dramatic collapse of the GOP’s effort to scrap the seven-year-old landmark law. Trump on Monday threatened to end subsidies to insurers and also took aim at coverage for members of ­Congress. But the White House insistence appears to have done little to convince congressional GOP leaders to keep trying. One after another on Monday, top GOP senators said that with no evidence of a plan that could get 50 votes, they were looking for other victories. “We’ve had our vote, and we’re moving on to tax reform,” said Sen. John Thune (S.D. ), one of Senate Majority Leader Mitch McConnell’s top lieutenants, speaking of the next big GOP legislative priority. McConnell did not address health care in his remarks opening Senate business on Monday afternoon. His top deputy, Sen. John Cornyn (Tex. ), brushed back comments White House budget director Mick Mulvaney made on CNN on Sunday urging Republicans not to vote on anything else until voting on health care again. 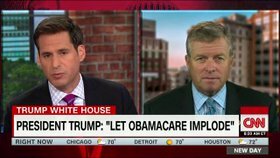 On Monday, Trump tweeted: “If Obamacare is hurting people, & it is, why shouldn’t it hurt the insurance companies & why should Congress not be paying what public pays?” He was referencing subsidies that members of Congress receive to help offset their coverage costs purchased through the District’s exchanges, as required under the Affordable Care Act. Sen. Rand Paul (R-Ky.) said Monday that based on a conversation he had with Trump, the president is considering taking executive action on health care, Reuters reported. A Paul spokesman did not immediately respond to a request for comment, and it was not clear what such an action could be. Health and Human Services Secretary Tom Price indicated over the weekend that he was considering using his regulatory authority to waive the Affordable Care Act’s mandate that all Americans buy coverage or pay a tax. Some rank-and-file Republican lawmakers have used the collapse of repeal-and-replace to offer new fixes and improvements to health care, but there was no sign their leaders were engaged. On Monday, Price met with fellow physician Sen. Bill Cassidy (R-La. ), who has proposed restructuring how federal money is distributed under the Affordable Care Act. Separately, a bipartisan group of 43 House members released details of their own plan. “We had a productive meeting. All involved want a path forward,” said Cassidy in a statement after his White House meeting, also attended by several governors. In addition to turning over federal funds to the states, Cassidy and Sens. Lindsey O. Graham (R-S.C.) and Dean Heller (R-Nev.) have proposed repealing key mandates and a tax under the law. But there are no signs that plan will be put to a vote any time soon. It has not been scored by the nonpartisan Congressional Budget Office. It’s unclear how many Republicans would vote for it. And McConnell is working on confirming Trump’s nominees this week. A growing number of Republican lawmakers have raised the prospect of working with Democrats on health care. The collection of centrist House Republicans and Democrats unveiled a proposal Monday calling for revisions they said would help stabilize the individual insurance ­market. Rep. Tom Reed (R-N.Y.), a co-chair of the centrist Republican and Democratic “Problem Solvers Caucus,” which released the plan, said he and his colleagues have been working on a draft for about three weeks, as they saw “the writing on the wall” that the Senate bill was likely to fail. Strong did not respond to a follow-up question about how that ought to happen. The House passed a sweeping rewrite of the Affordable Care Act this year, with only Republicans voting for it. The Senate tried to pass its own version but was unable to reach an accord, even on a more modest bill that was meant to keep the talks alive in both chambers. That bill was rejected Friday when Sen. John McCain (R-Ariz.) joined two other Republicans to sink the legislation in a tension-filled vote that happened while most of the country was asleep. In their outline, Reed and his colleagues said federal cost-sharing subsidies should be placed under congressional oversight and that mandatory funding should be assured. Now such disbursements are up to the Trump administration, which has been paying them monthly but has threatened to withhold them. Top Democrats and Republicans warned against that. “Right now, as insurers prepare to lock in their rates and plans for 2018, the Trump administration is dangling a massive sword of Damocles over the heads of millions of Americans — threatening to end payments the administration is supposed to make that would lower deductibles and out-of-pocket costs for so many Americans,” said Senate Minority Leader Charles E. Schumer (D-N.Y.) on the Senate floor. Thune said he was “hopeful” the administration would keep making the payments. After Friday’s vote, some Democrats have felt more empowered to talk about changes to the Affordable Care Act. The centrist House lawmakers want to repeal the 2.3 percent tax on medical device manufacturers and loosen the employer mandate under the Affordable Care Act. The law says companies with 50 or more full-time employees must offer coverage. They want to raise the threshold to 500. They also said they want to create a state stability fund to reduce premiums and spur more innovation at the state level. Getting health-care legislation backed only by Republicans to Trump’s desk by the end of August is all but impossible, even if they suddenly put aside their disagreements. The House is in recess until September. The Senate is scheduled to be in session the first two weeks of August. The prospects of a bipartisan deal were just as doubtful, amid fierce partisanship that has gripped the Capitol in the Trump era, which has shown no signs of abating. Even those pushing for one were tempering expectations. This entry was posted in Health Care News and Opinion and tagged donald kenton henry editor, donald kenton henry insurance broker, health care freedom act, healthandmedicareinsurance.com, HealthCare.gov, president trump, texas health insurance, the affordable care act, the patient protection and affordable care act, thewoodlandstxhealthinsurance.com by thehealthinsuranceanswerman. Bookmark the permalink.